Urbanists are apt to decry the loss of “public space” and by “public space they tend to mean sidewalks, plazas, pocket parks, etc. and they are right to oppose these things. Yet I seldom see urban planners or urbanists get up in arms over the dwindling numbers of public libraries. Those are inside, I suppose, and not Of The Streetscape, which I think renders library beneath the attention of most urban advocates. Yet many libraries are public spaces, spaces where anybody can go and read a book. Benjamin Franklin’s vision of the library was a worthy one. I suppose for my younger readers, the Web has supplanted the library. A pity. Because while the web can be a commons, it is not a place where anybody can sit and take comfort. Those are, indeed, becoming rare–unless you buy a $4 latte. 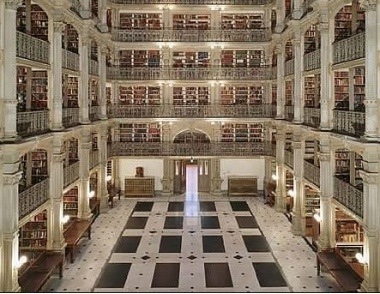 Odee’s list of 20 “Most Beautiful Libraries” inspired me to thinking about this. To the above right here is the George Peabody library in Baltimore (I believe of the same Peabody’s that yielded Mrs. Barbara Bush; it must be rough). My first library was in Lamont, IA. It was decidedly more modest. But I was hooked for life; it was a democratic place, even if dirty books were discretely kept from little hands, and I will be forever grateful. Nothing, absolutely nothing, is as restful to me as browsing in a library, or settling into one of the chairs to read. It is one of the fundamental pleasures of urban life—a shared common place, where ideas are about you.